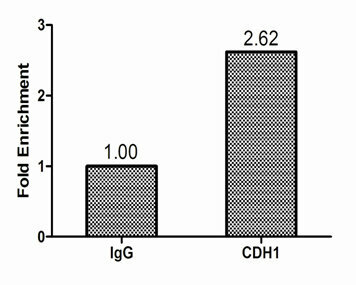 Chromatin Immunoprecipitation Hela (1.1*106) were cross-linked with formaldehyde, sonicated, and immunoprecipitated with 4ug anti-CDH1 or a control normal rabbit IgG . The resulting ChIP DNA was quantified using real-time PCR with primers against the RPL30 promoter. ATP-dependent chromatin-remodeling factor which functions as substrate recognition component of the transcription regulatory histone acetylation (HAT) complex SAGA. 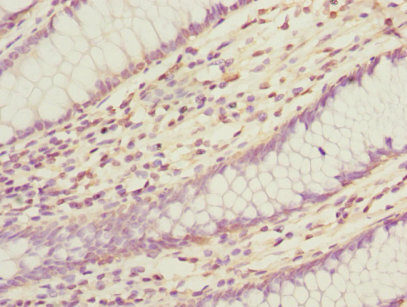 Regulates polymerase II transcription. Also required for efficient transcription by RNA polymerase I, and more specifically the polymerase I transcription termination step. Regulates negatively DNA replication. Not only involved in transcription-related chromatin-remodeling, but also required to maintain a specific chromatin configuration across the genome. 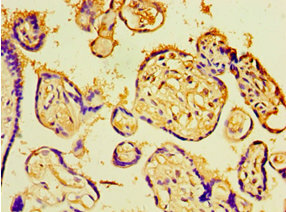 Is also associated with histone deacetylase (HDAC) activity. Required for the bridging of SNF2, the FACT complex, the PAF complex as well as the U2 snRNP complex to H3K4me3. Functions to modulate the efficiency of pre-mRNA splicing in part through physical bridging of spliceosomal components to H3K4me3. Required for maintaining open chromatin and pluripotency in embryonic stem cells. 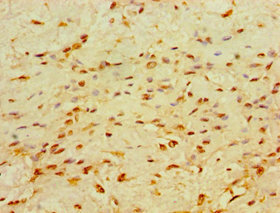 CHD1 Polyclonal Antibody. Unconjugated. Raised in: Rabbit.